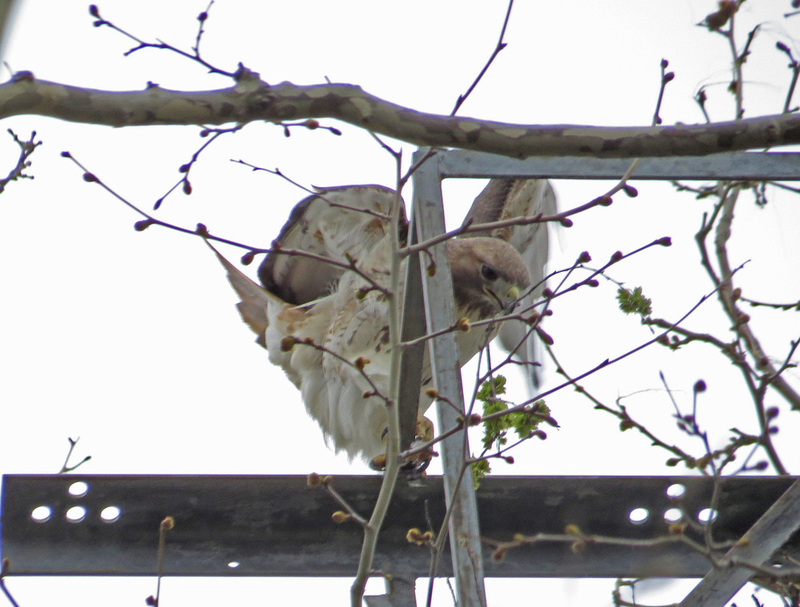 This is a continuation of the Red-Tailed Hawks page. 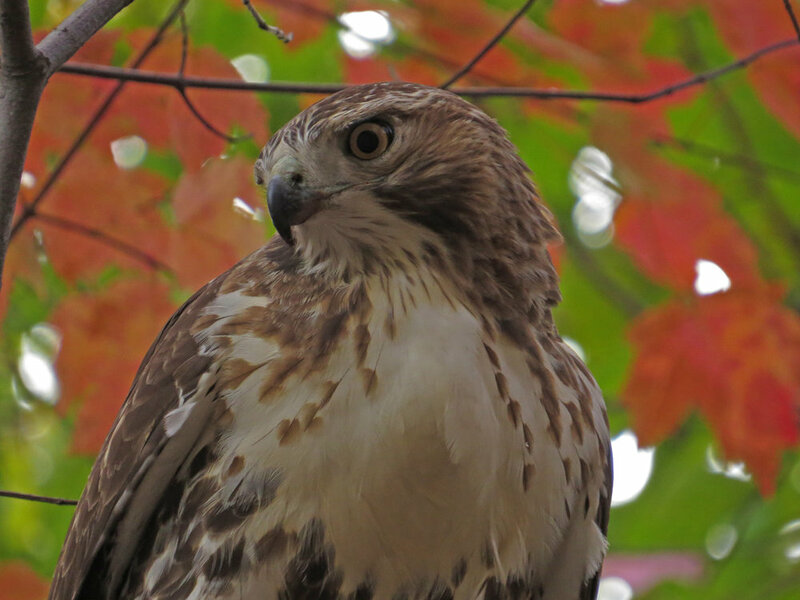 It includes more photos of the red-tailed hawks. 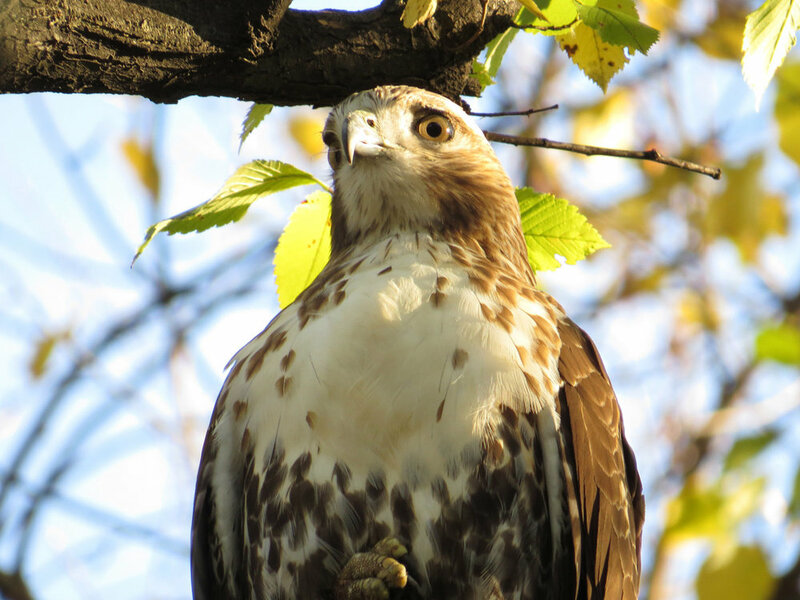 In the spring of 2016, there were two red-tailed hawk nests close to each other, both with brooding females, one in a tree in Riverside Park and one at Grant's Tomb on a light platform. We watched both nests and tried to photograph the hawks. On April 9, I was able to watch the Grant's Tomb hawks for a while and produced a video, A Rainy Afternoon With the Grant's Tomb Hawks. I also got to see the Riverside male hawk catch a pigeon, pluck it, and then leave it on a branch to later dinner or for his mate. Unfortunately, it appears that although the Grant's Tomb eggs hatched, the babies did not survive. Several visits to the nest yielded no movement whatsoever, and no visit by the adults. 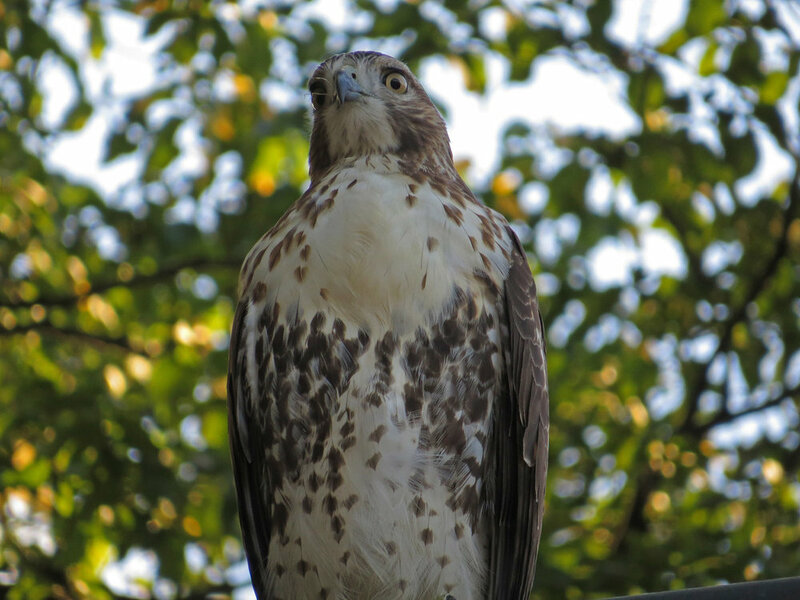 There are a pair of hawks, named Fred and Ginger by my friend Tahj, that have tried to nest on the Beresford building on Central Park West. This year they have been seen mating and carrying sticks to various places, including the Beresford and the San Remo. Unfortunately, one of Ginger's eggs rolled off the San Remo ledge. Despite the pair's bad luck, we continued to hope that they would succeed in nesting and having little baby Freds and Gingers. But there has been no sign of nesting, and we assume the nest has failed. 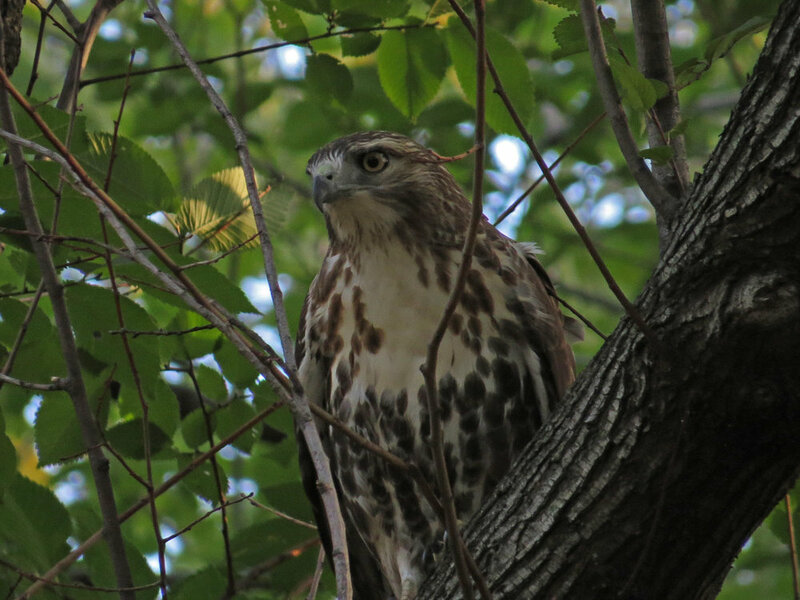 This pair likes to hunt between 72nd Street and 86th Street on the west side of Central Park (that area on the east side is hunted by Pale Male and Octavia). 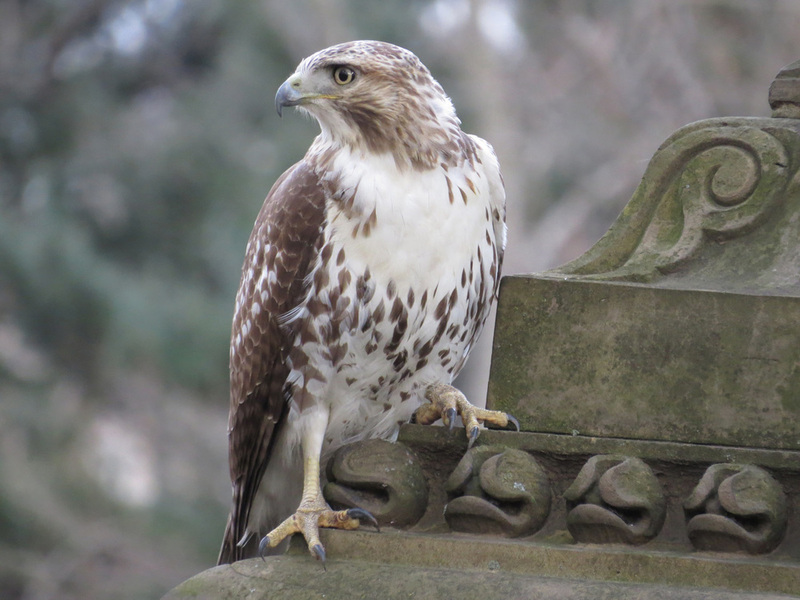 On March 28, Fred caught a rat just south of the 86th Street transverse, north of the Pinetum. I caught some of the action on video. Stick visited Central Park for at least two weeks this past winter. 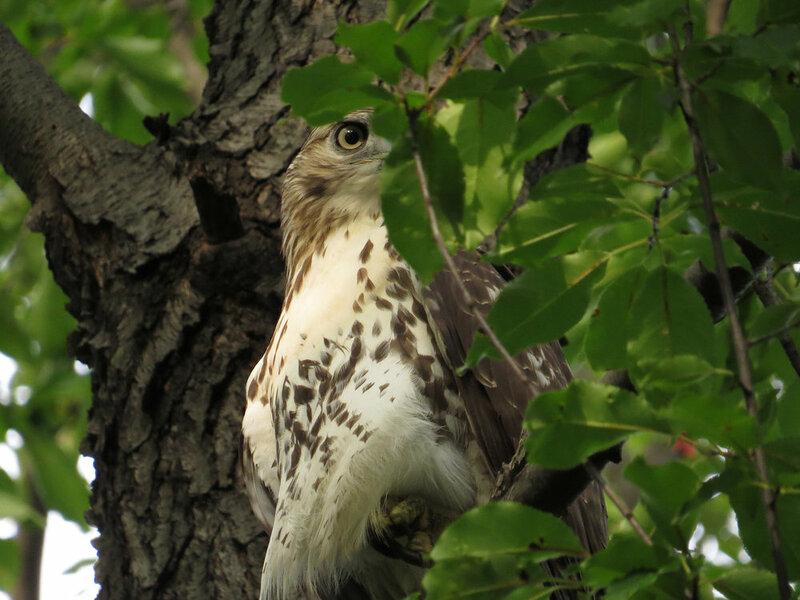 The first-year red-tailed youngster hung out around Strawberry Fields and the Bandshell, until chased out of those areas by the Beresford hawks. 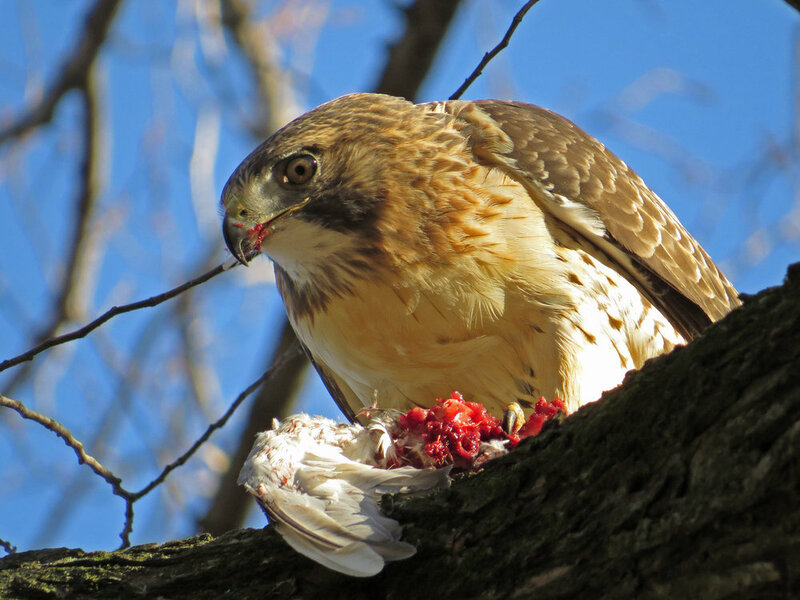 The hawk got the nickname because on Feb. 3, 2016, after getting harassed by blue jays and moving up several branches in a tree, he pulled off a small branch and flew to another tree, where he proceeded to flip it around with his talons, then wave it around in his beak. After several minutes of playing with the branch, he dropped it. You could almost read his mind as he looked down: "I dropped my stick. I dropped my stick. Now what?" His decision: to fly north over Bow Bridge, into the Ramble. This is the video of Stick on Feb. 3. Following that are photos from time spent watching Stick on Feb. 10. 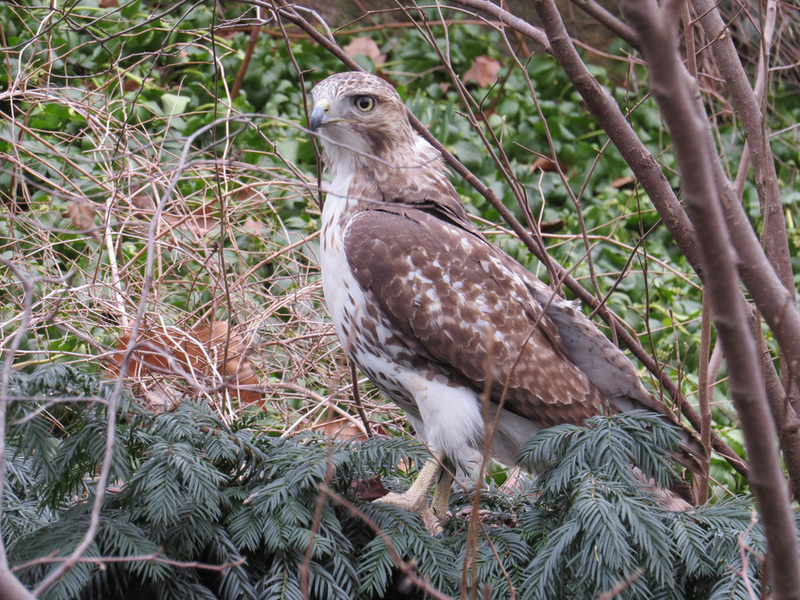 This video follows Stick from Feb. 3 (one photo) to Feb. 23, as the youngster tries to get by in Central Park despite the screaming blue jays whacking him and the adult red-tailed hawks chasing him out of "their" territory. The photos that follow are from Feb. 7 through Feb. 23. Left: Stick on Feb. 12, after trying to catch a rat at the Bandshell. Right: A snowstorm on Feb. 15 shows Stick wondering what the white stuff is. Left and center: More Stick in the snow. Right: Stick after a heavy rain on Feb. 16. Left: Feb. 21. Stick is hiding out from the adult red-tailed hawks. Right: Just before Ginger, the female adult Beresford hawk, swoops down from the Dakota to chase Stick out. Feb. 22, at the Bandshell, on a gorgeous sunny day. Top left: Feb. 22. Top right: Feb. 22, this shot from my camcorder. Bottom left: Stick Hawk, Feb. 22. Center: Feb. 21, and time to play with sticks. Right: Stick on Feb. 7, before being chased out by R.T. 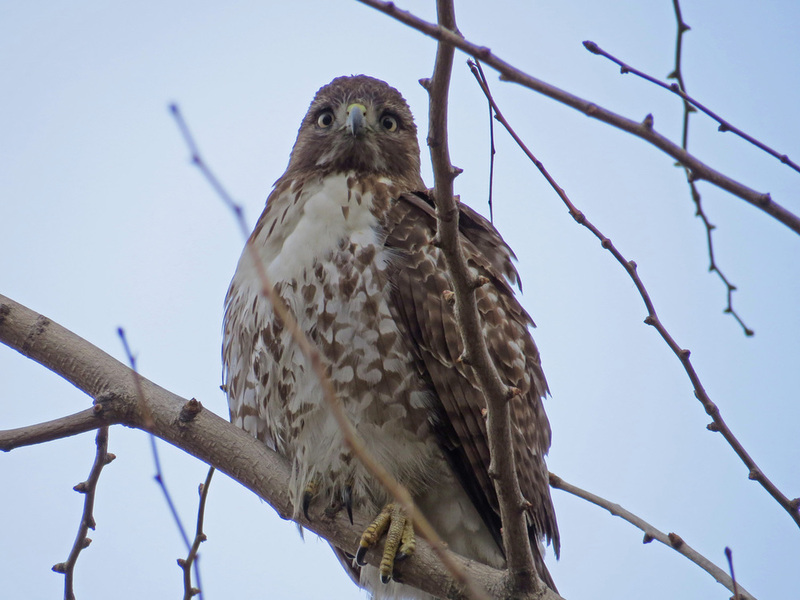 This juvenile red-tailed hawk was seen on top of the NYPD precinct on the 86th Street transverse on Feb. 9, 2016. 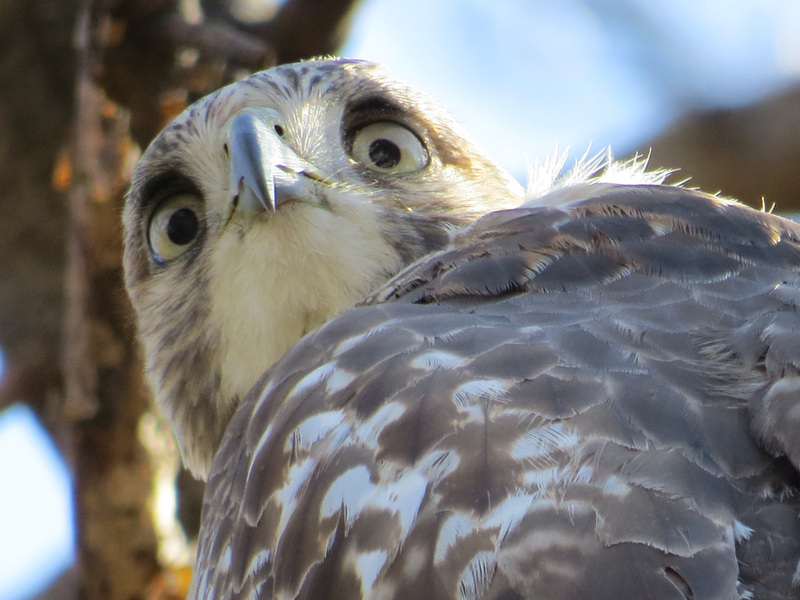 It is a first-year hawk, with a lot of personality. We call him/her Rezzie (for Reservoir Hawk). 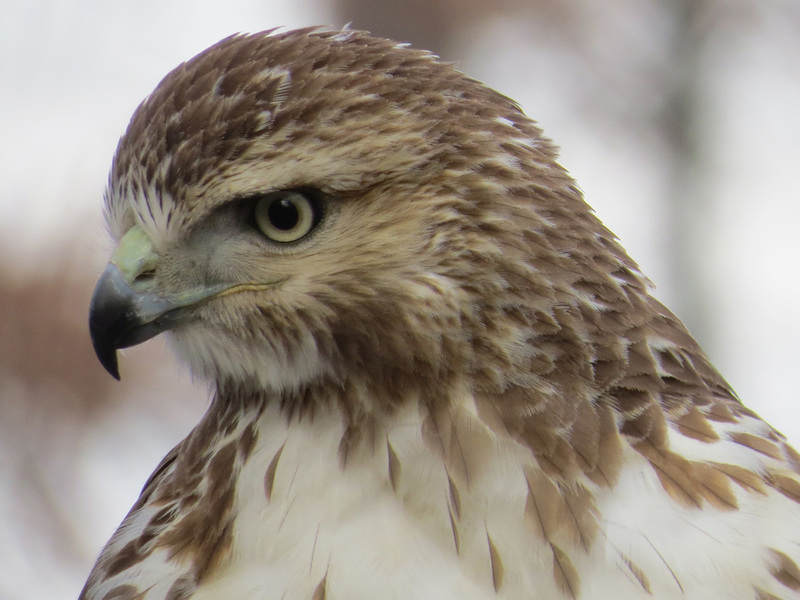 There was another first-year red-tailed hawk in the park this past winter, one we called R.T. (Artie) Hawk (for Red-Tailed). Artie was a fun hawk to watch, because when he (some insist she's a she!) 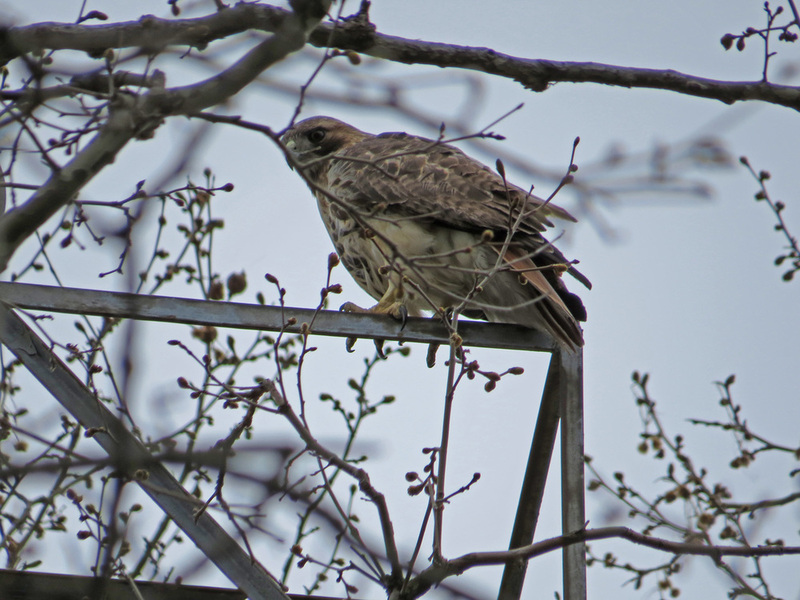 was chased out of an area by an adult hawk, he would wait a little while then sneak back to where he'd been before. Artie has starred in two Silly Videos so far. This addition to the Chasing the Hawks in Central Park series of Silly Videos features Sheep Meadow Mama sitting two branches above her nest on Oct. 29, 2015. Unfortunately, when the tree with the nest was seen on Jan. 9, almost all the branches had disappeared. By Feb. 7, the whole nest was gone. 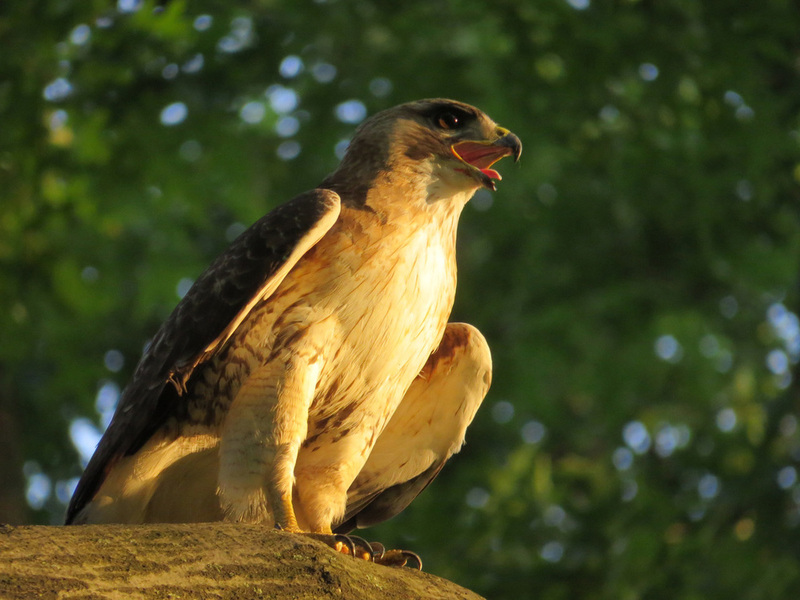 We are hoping to hear what happened to the nest, and hoping even more that the Sheep Meadow hawks will rebuild there, since it is such a wonderful location to watch the youngsters (see below). But as of May 21, 2016, there has been no news of the Sheep Meadow pair having hatched any youngsters. 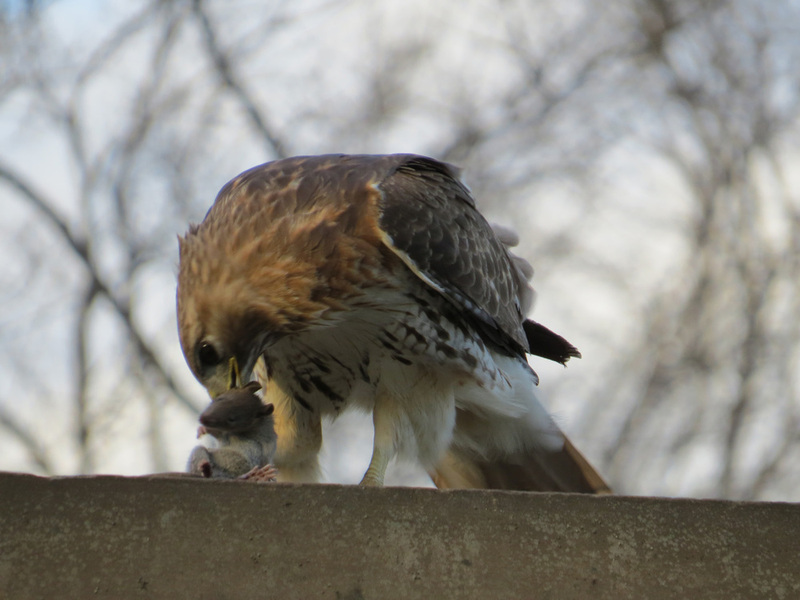 In 2015, the Sheep Meadow red-tailed hawk couple hatched three eyasses. Toward the end of May, they looked like little space aliens. Pale Male and Octavia also hatched three younguns over on Fifth Avenue (note: there is a separate page for Pale Male and his family, fitting for a feathered celebrity).. 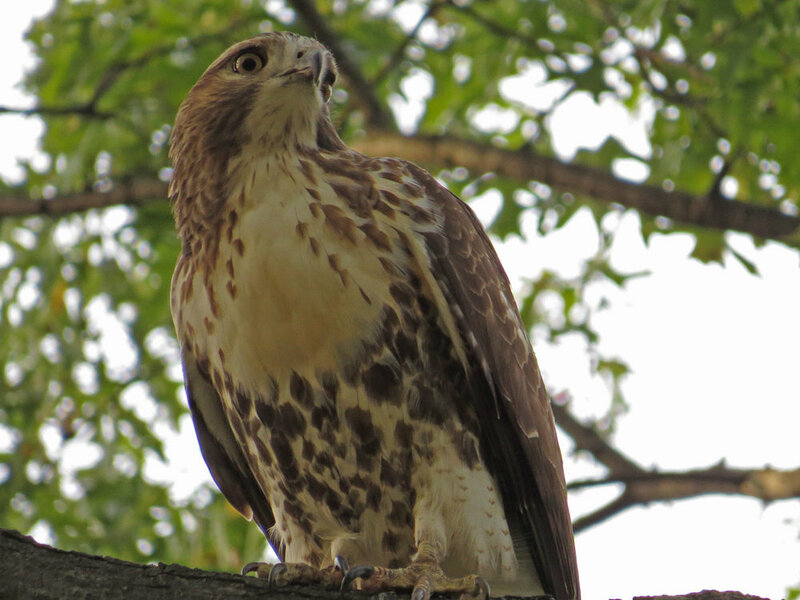 The six young hawks fledged and throughout July were flying around Central Park, learning to hunt and crying up a storm. 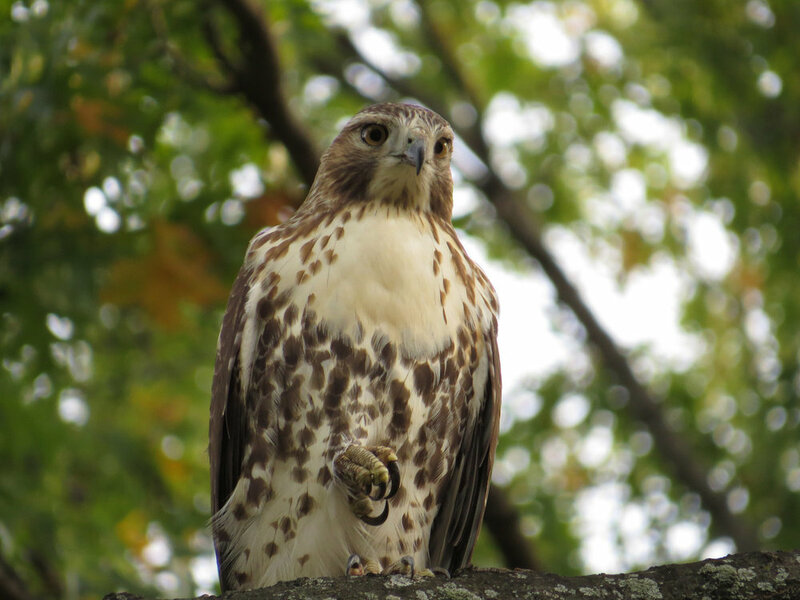 Unfortunately, a young hawk, probably one of Pale Male's babies, was found dead on Aug. 12. Another Pale Male youngster was sick with what is probably a disease she got from eating pigeons (she was rescued and taken to a rehab site on Long Island), and the third has been seen in a tree, probably sick as well. The three Sheep Meadow babies in 2015 seemed to be all right, but it is a hard life out there for young hawks! Thiis next video was shot on Aug. 21 and features a visiting young-adult red-tailed hawk taking a bath in a stream near Azalea Pond in the Ramble. We held our breath because the hawk was so close to us, we didn't want to flush the bather. 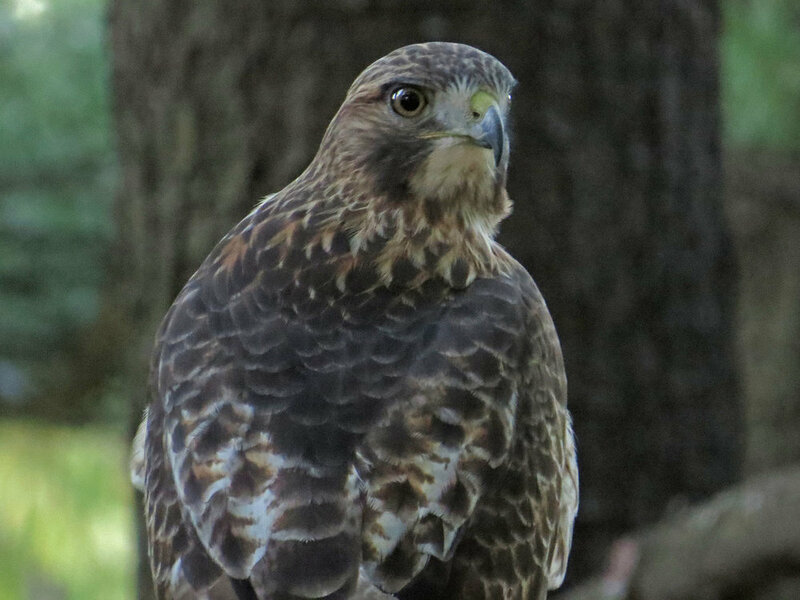 The following video, also featuring a young-adult red-tailed hawk, was shot Aug. 7 and shows the visitor eating a pigeon in Strawberry Fields. These baby photos are of the Sheep Meadow babies. The first shot, from May 26, 2015, provides definitive proof that Central Park was invaded by aliens. The next shots are from June 11, and show Mama in the nest feeding the kids, the kids, and then Sheep Meadow Mama and Papa on branches near the nest, keeping watch. The Sheep Meadow youngster below was perched on a fence just north of Sheep Meadow on July 21, near the croquet court, watching squirrels. The photo below is of two Sheep Meadow youngsters. 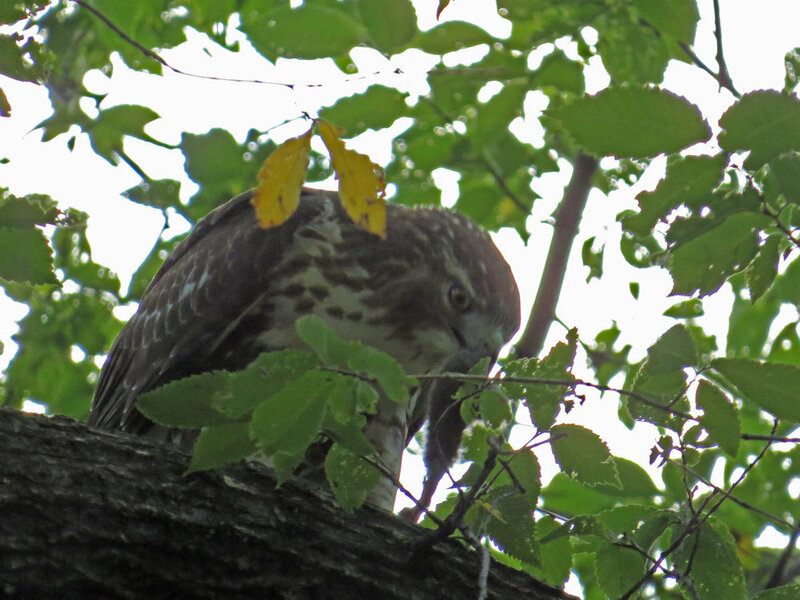 It was taken on July 19 in the elm grove across from the nest. Both young hawks had been on the ground devouring a pigeon, then flew up on this branch. May 30 provided a source of great amusement in three visits to Sheep Meadow. The result: Saturday in Sheep Meadow With the Red-Tailed Hawks. I especially like the interaction between the two hawk parents (about 1:50 in). On May 23, I visited Sheep Meadow and watched as Mama fed her three kids. Suppertime in Sheep Meadow, Another Silly Video by Susan Kirby, is the result. 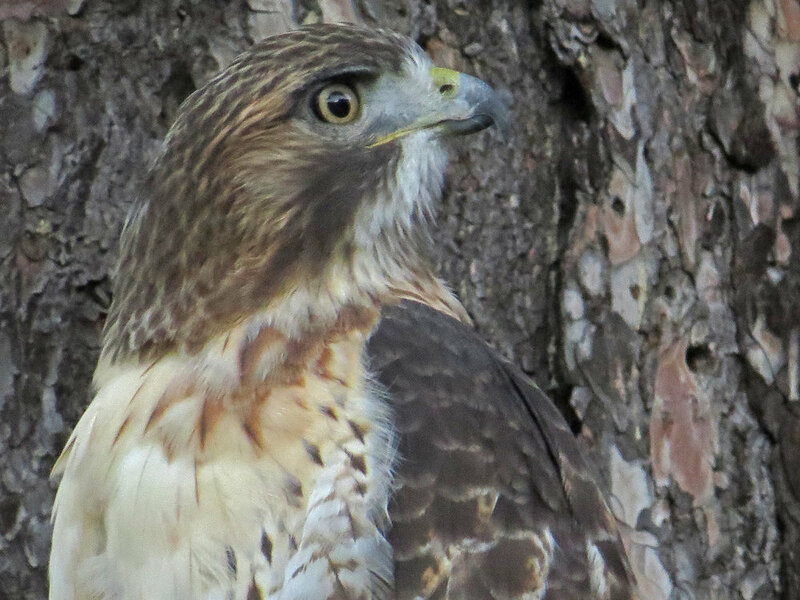 I have taken hundreds of photos of hawks, including the visitors we often see, and am now editing them down. For now, I want to share a few of my favorite hawk photos. 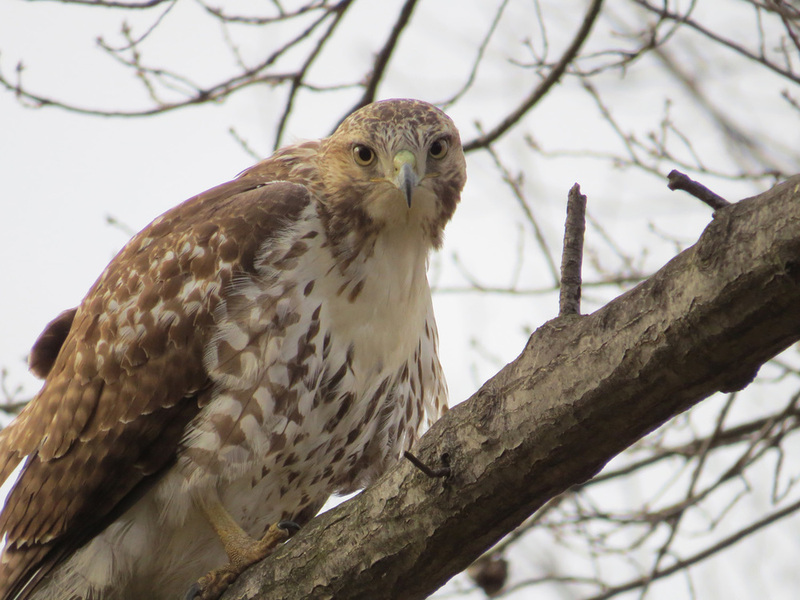 This juvenile red-tailed hawk was chased around the Ramble on March 24. I took a lot of photos, but this one was my favorite. This one was taken on Jan. 17, 2015. This is a juvenile hawk that was flying around in the Ramble. It didn't catch anything while I was watching, but it certainly had fun practicing its fierce stare. 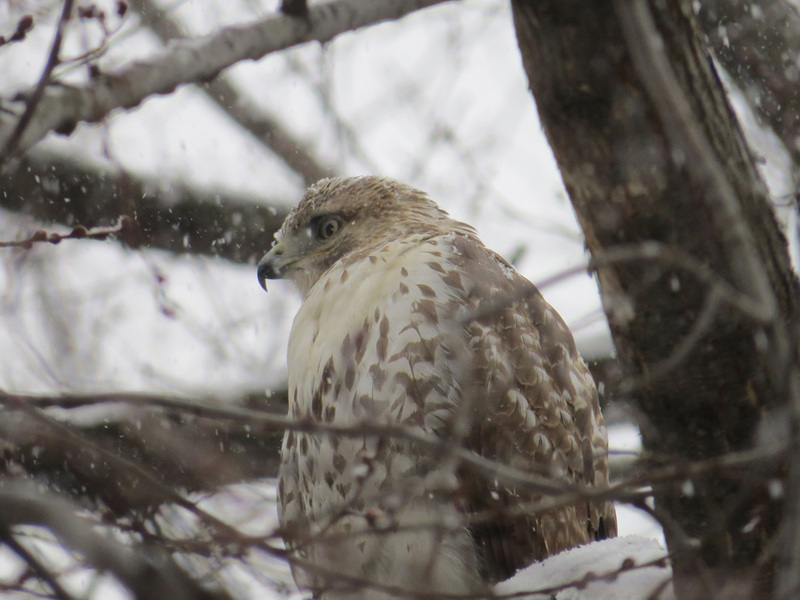 The "Blizzard of the Century That Wasn't" on Jan. 26 was great for beautiful snow in Central Park, and a juvenile red-tailed hawk swooped into the Upper Lobe and perched on a tree just in front of me as I was feeding the cardinals and squirrels. I took a lot of video of this kid, and also a lot of photos. 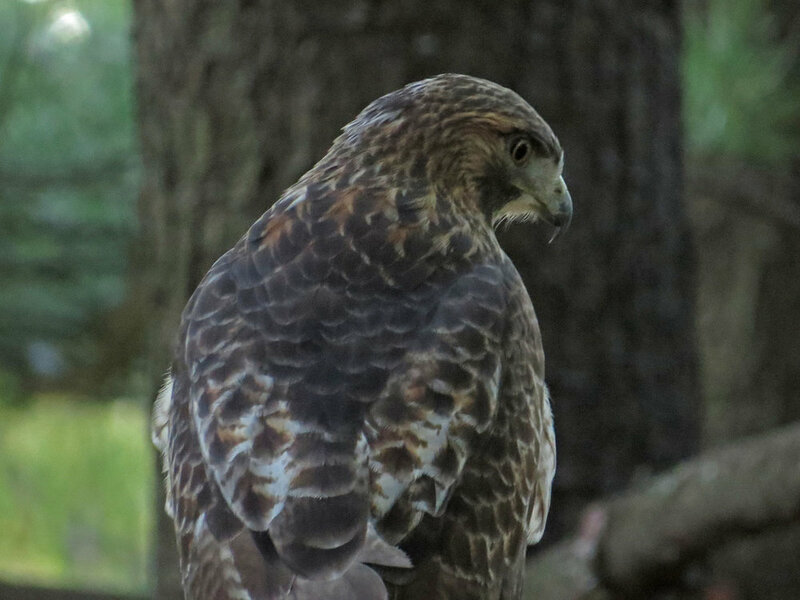 This photo is one of my favorites, showing the youngster watching a squirrel that had forgotten the hawk was there. Central Park had a nice snowfall on Jan. 5, with big flakes swirling around Literary Walk and another young hawk, perhaps Junior, one of the Sheep Meadow babies. I did a short Silly Video called Let It Snow, Let It Snow ... What's Snow?